KiraGrace is not responsible for lost or stolen products once delivered to your address. We appreciate your cooperation and understanding. KiraGrace cannot control and is not responsible for any duties/taxes applied to your package. You will be responsible for paying additional charges for customs clearance. Customs policies vary widely from country to country; please contact your local customs office for further information. Note, in rare occasions custom agents may delay delivery of some packages. By law, we must declare all items at their full price and cannot alter this amount to decrease international customs fees. If you refuse a shipment from KiraGrace, you are responsible for the original shipping charges, any import fees that are incurred on the package, and the cost of returning the package to KiraGrace This amount will be deducted from your merchandise refund. In the instance the return fee exceeds the amount of the merchandise plus shipping costs, the package will be abandoned and you will not be refunded. Our goal is for you to feel beautiful in your KiraGrace gear. If you are not completely satisfied with your regular price purchase, you may return it within 14 days of the delivery date for a full refund. All returned merchandise must be in new, unused condition with original tags attached. Due to the intimate nature of activewear, we do not accept products that have been worn, altered, or washed. Merchandise received after 14 days of delivery will only be accepted at our discretion for a store credit or exchange. Any item returned after 30 days of delivery will not be processed. If products are returned in unsaleable condition your refund or exchange will not be processed. All merchandise must be purchased from KiraGrace.com (we cannot process returns from third parties). All returns require pre-authorization. A return authorization is an approval to send back an item for consideration of a refund, store credit, or an exchange. Please submit your return request through our online portal. Simply log into your KiraGrace customer account, view the order using the Complete Orders link under your account menu, click the Return Item(s) button, and select the items you'd like to return. Once we have authorized your return request, you will receive shipping instructions. Return Labels: We are happy to provide customers within the United States a USPS return label for a convenience fee. If you select 'yes' to this prompt, KiraGrace will email you a pre-paid shipping label to send your return item(s). You pay nothing upfront. A $9.95 convenience fee will be deducted from your refund. You can also choose your own mail carrier and shipping method. Returns may take up to 10 business days to process from date of receipt at the warehouse. You should expect to receive your refund within four weeks of giving your package to the return shipper, however, in many cases you will receive a refund more quickly. This time period includes the transit time for us to receive your return from the shipper (5 to 10 business days), the time it takes us to process your return once we receive it (5 to 10 business days), and the time it takes your bank to process our refund request (5 to 10 business days). Please note in some cases a re-stocking fee may be applied to your credit. If there are any issues with your purchase we'd be happy to help fix the problem. KiraGrace monitors returns to identify potential misuse or abuse of our return policies. We reserve the right to refuse service to anyone and may refuse or delay returns if fraud or abuse is suspected. The "Gratitude Gift Set" offer is valued at $300. "Gratitude Gift Set" offer value is subject to adjustment: if purchased items are returned, cancelled or exchanged, the offer's value will be deducted from your refund. "Gratitude Gift Set" is final sale and non-refundable. Cannot be redeemed for cash, exchanged or returned. Additional taxes and duties may apply to orders shipping outside the US. This offer is not combinable with any other promotion. Our styles are HOT! Due to strong demand, select styles and sizes may be out of stock. But don't worry, we provide the option to pre-order that cutie you just can't live without! Please note that payments for pre-ordered items will be processed at check-out and are expected to ship as noted on the product detail page. All wholesale orders are final sale, no returns or exchanges. This luxe subscription service sends you gorgeous fashion-forward items for your active lifestyle. Each month or quarter you will receive a little black box expertly curated with the latest fashion pieces. Every box includes: Two personally curated items (e.g. one top and one bottom). 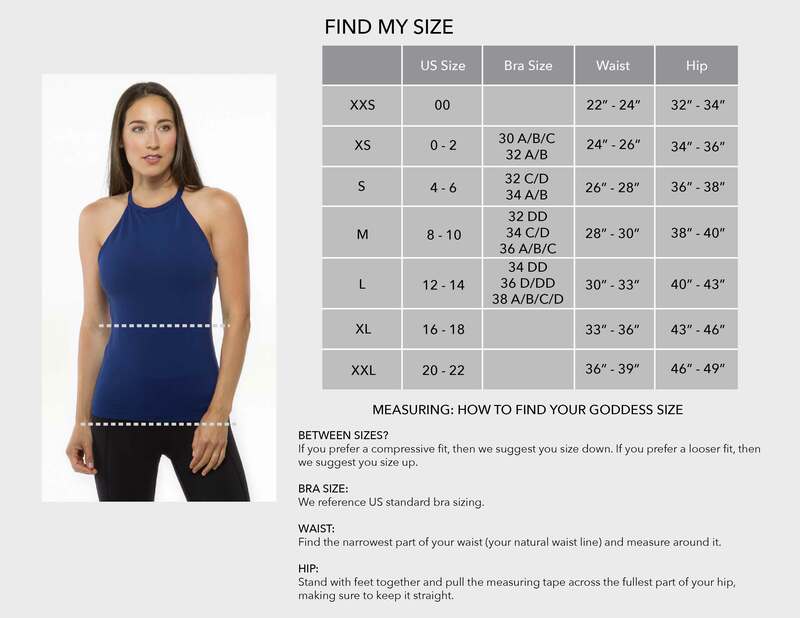 May include 1-2 additional active essentials (bra, headband, layering top, or any cute little piece that pulls the outfit together and gives you more wardrobing options). Only $149 per month or quarter for a value of over $250. Monthly subscribers: At the beginning of each month, we will send you a preview of the Little Black Box of the month directly to your inbox. Your order will be automatically shipped to you each month according to your sign up date. You can easily adjust your subscription settings (e.g. payment, shipping address, frequency) in your KiraGrace customer account. Quarterly subscribers: Your order will be automatically shipped to you each quarter according to your sign up date. You can easily adjust your subscription settings (e.g. payment, shipping address, frequency) in your KiraGrace customer account. Monthly subscribers: You need only subscribe one time by purchasing your first monthly box on our website. You will not need to purchase the next month's box; your credit card will be charged automatically every month according to your sign up date. Quarterly subscribers: You need only subscribe one time by purchasing your first quarterly box on our website. You will not need to re-purchase the next quarter's box; your credit card will be charged automatically every quarter according to your sign up date. Currently, Little Black Box subscriptions and renewals will include sales tax for subscriptions sent to the states we have nexus in. - Domestic: KiraGrace is proud to offer free standard shipping on all domestic orders within the U.S. Once your order is placed and shipped you will receive a shipping confirmation with a tracking number. Boxes are shipped via FedEx. Please note your box will be dropped off at your doorstep without signature confirmation. It is the customer’s responsibility to ensure their box can be dropped off and left unattended without signing for it upon delivery. - International: Shipping is available to the majority of international Little Black Box subscribers. When you place your international order, we will estimate shipping costs based on the weight of the box and the shipping option you choose. USPS is our carrier for most International packages. Import duties, taxes, and charges are not included in the item price or shipping cost. These charges are the buyer's responsibility. Please check with your country's customs office to determine what these additional costs will be prior to buying. You may cancel your subscription at any time, as long as you log into your account and cancel your subscription prior to your recurring charge date. There is no cancellation fee. Once your account has been charged for the feature month or quarter, we cannot cancel your order. We can, however, close your account down so you will not have any recurring charges in the future. The Little Black Box is FINAL SALE and non-refundable. The content of your little black box is carefully curated by our expert styling team, so we do not allow returns, refunds, or substitutions of any kind. Any box returned by a customer will not be processed. If you receive a box with damaged/defective product, incomplete contents, or require a size exchange - please email us at customerservice@kiragrace.com within 14 days of your processing date. If you have any questions or concerns about your order, please contact us at customerservice@kiragrace.com or 858.412.5334 and we'd be happy to help. Our hours of operations are Monday-Friday 8am - 4pm Pacific time.